Balance disorders affect people across all walks of life. For older adults, balance-related falls account for more than one-half of accidental deaths. Patient care costs for falls, which are primarily due to balance disorders, exceed $8 billion per year. Strength and Stability classes are intended for anyone hoping to improve their balance, coordination, strength, flexibility, and overall well-being. These classes include various activities and exercises in a circuit-style environment. Individuals must be comfortable exercising in a group setting and be able to stand and move independently without a cane or walker. Please be sure to speak to your physician before beginning any exercise program. The next session will begin the week of January 8, 2018. The cost of any Strength and Stability class is $60.00 each session. Classes run for a 5-week session and include 10 classes. Sessions run continuously through the year and repeat every 6 weeks (1 week off in between sessions). 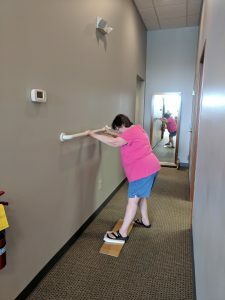 Participants in our Strength and Stability Classes can expect to have an interactive, fun workout experience. Each class has limited space available. Public enrollment begins 3 weeks prior to the new session date. For more information or to check availability and register please contact us at 815-756-8524. This is an exercise program for promoting strengthening and mobility, designed to maintain and improve your current level of function. 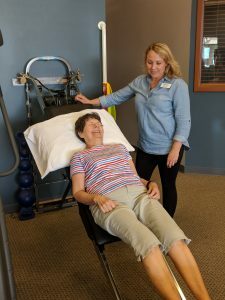 This program is supervised by our exercise specialists who will consult with your physical therapist to assure a smooth transition into an independent exercise program. This program is available at our DeKalb Sycamore Road and DeKalb Lincoln Highway clinics. Please be sure to speak to your physician before beginning any exercise program. The cost is $65/month or $180 for 3 months. For more information or to make an appointment, please call us at 815-756-8524. This is a one-on-one program designed to foster education and independence in the self-care skills needed to maximize success and performance throughout the golfer’s life. Examination of the muscles and joints involved in the golf swing. Video camera analysis of the golf swing. Instruction in specific strengthening and stretching exercises to correct any imbalances found in examination. Review and modification of current golf conditioning program (if present). The initial session will take place at Northern Rehab and costs $75. Each subsequent session can be held at Northern Rehab or golf course of your choice to re-evaluate progressions in the golf swing, musculoskeletal gains and provide program progression for $60 per session. This is a one-on-one program designed to promote optimal balance, strength, flexibility, and technique specific to runners. Your program will aim to sustain your enjoyment and longevity in the sport of running by educating you about proper shoe selection, training schedules, and self-care skills. Screening of flexibility and strength in both legs. Video camera analysis of running mechanics and training on proper mechanics. Evaluation of foot type and recommendation for appropriate running shoes. Review and modification of training routine/ schedule. The initial session will take place at Northern Rehab at a cost of $75. Each additional session costs $60. Contact us to schedule an evaluation. 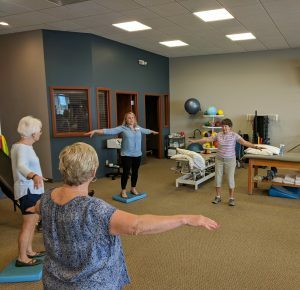 Northern Rehab Physical Therapy Specialists hosts a free Dizziness and Balance Support Group. This support group is designed for anyone seeking support with dizziness and/or balance issues. There are many perceptions of dizziness including unsteadiness, an off-kilter feeling, spinning, lightheadedness, and blurred vision with movement. Everyone is welcome at this open forum support group and there is no charge to attend. For more information, please call Northern Rehab at 815.756.2369 or 815.756.8524. Please check back soon for our next Dizziness & Balance Support Group meeting date. Northern Rehab’s professionals conduct a wide range of educational seminars targeted toward athletes of all levels and sports, local coaches, and parents, as well as programs for workers injury prevention, or other general discussions. Topics include: proper warm-up, performance enhancement for general sports, running and golf performance enhancement, as well as proper hydration and injury prevention and concussion/ImPACT assessment education for all sports, and information on back, neck, or knee pain, headaches and TMJ, dizziness, fall prevention, and more. We can customize a topic at your request. Please contact us to find out what programs we can offer for you and your team, business, or organization at 815-756-8524. The next session will begin the week of May 13, 2019, but you may join at any time.